The Club has a range of mooring options: 26 Pontoon Moorings; 14 Trot Moorings (where you tie fore and aft to a buoy) ; 5 swing moorings; and 31 beach moorings. In addition we have some kayak racks and storage space for small inflatables. We do dry out at low tide but we are good 4 hours either side of high tide. We are also very protected from the weather. The Club offers Summer and Winter moorings. Please call Tom on 01326 340525 if you are interested in finding out more about renting a mooring. Forms, cash and cheques can be left at the bar with Nigel. EVERYONE who had a mooring last year should have received a letter from me by the end of this week (they have all been posted) with forms for 2019. The only exception to that are the three boats whose owners have let me know that they are not coming back for the summer. If you haven’t had a form for your mooring, please call Tom on 01326 340525. We’re going to be pretty full again this summer but there are some trot moorings available and some kayak racks. As previously reported, we are adding 8 new pontoon slots in February at the clubhouse end of the pontoon. We will wait until we hear from all existing pontoon members to see whether there are any additional spaces for this Summer and then I will work through the waiting list for pontoon spaces. 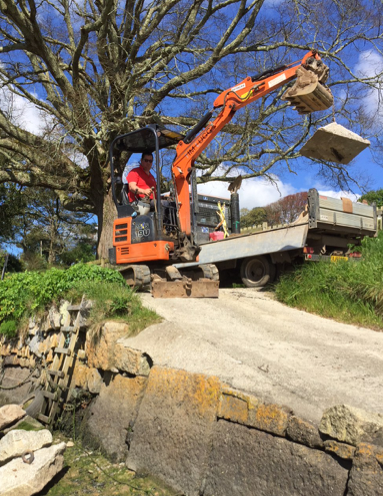 We are going to remove 5-6 beach moorings at the further end of the beach to make more space and this will involve me re-numbering the beach wall. I might stick with my accidental reverse 4’s since I think it has a certain house style about it. Do call me on 01326 340525 or email admin@pnyc.co.uk if you have any questions or need any moorings for this Summer. We are also happy for boats to take up their moorings earlier than 1st April provided that you have the right insurance. Just contact me and we can work out a rate based on Winter mooring fees. As mentioned in earlier newsletters, after at least five years of no change, we have reluctantly and with much thought changed our mooring fees. One member cheerfully asked me whether they were going up or down and, sadly, I have to confirm that they have gone up. Over the last 18 months we have been working hard to improve the club; totally renovating the men’s loos and the shower; re-building the beach wall; putting in a fat trap and a new treatment plant (more on that below); putting additional anchoring on the beach chain; news buoys with top mounted rings for the trot moorings; and a start to improving the pontoons. Going forward we intend to do further work on the pontoons (particularly the floats), renovate and re-open the Ladies loo and generally paint everything. 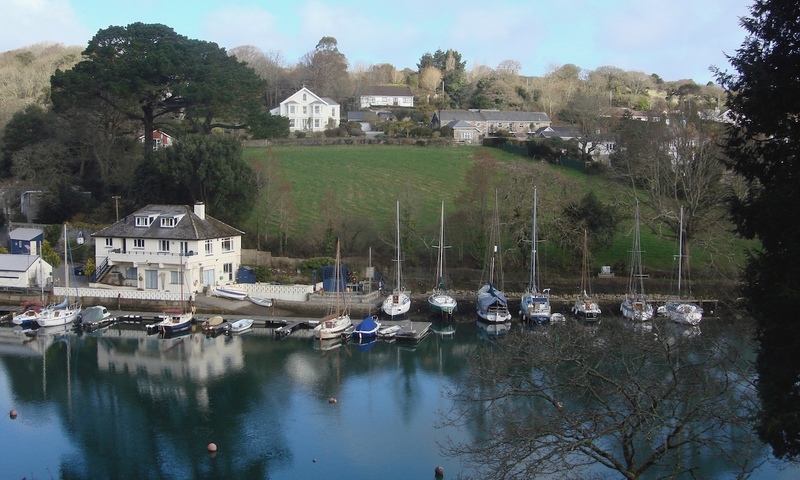 In spite of the changes to the mooring fees, we believe that we are still incredibly competitive in terms of fees on The Helford River. We have posted the new mooring fees on the website and I have sent a letter to every single mooring holder. The biggest change is to the beach where we have decided, after much thought, to create two types of fee. The first is a fixed price for keeping a small tender, i.e. 10ft and under, on the beach. And the second is a per foot or part thereof fee for boats between 11 to 17 ft, which is the same system used for calculating the fees for the pontoons, trots and swing moorings. I am happy to talk anyone through the changes. Try to ensure that all the boats are pulled out alongside each other rather than some in front and some behind. We have had one instance of a boat damaging another one with it’s un-covered outboard propeller digging into the bow of the boat as they sat one in front of the other. I have, with the very kind permission of the owner, removed one boat from the end of the beach to make more room. That boat is now on a trot giving you all a bit more space. I am sorry that it has been so crowded this year in spite of removing two places from the wall. 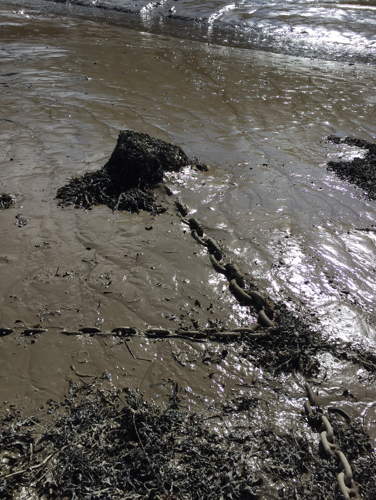 As reported in the last newsletter, the four mooring stones holding the large chain from which all the beach moorings extend at the low water mark, had all moved and been pulled out of the mud (see picture below left). 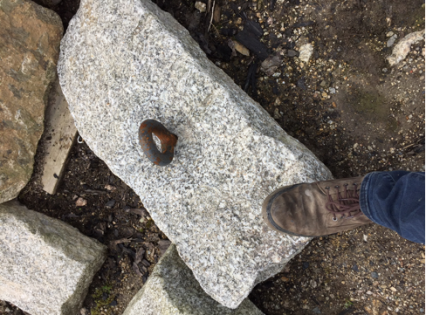 With the help of Tim Lugg, we have added four larger new mooring stones to the four that were already there and we have dug all the stones into the mud. Hopefully that should stop any further movement. While doing the new stones, we decided to straighten out the beach chain. To do this, I cleverly released the ropes on the beach wall so they wouldn’t be pulled as well. 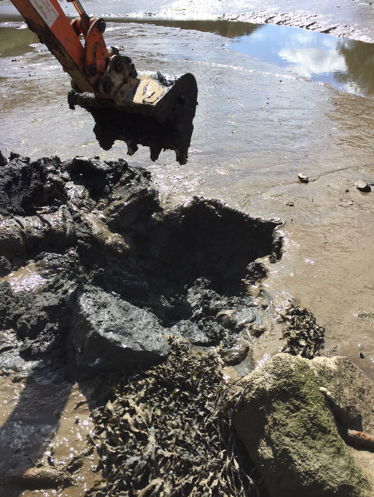 We straightened the chain and sunk the 8 stones into the mud. All good. All good at least until I came to fixing the running lines back onto the beach wall. 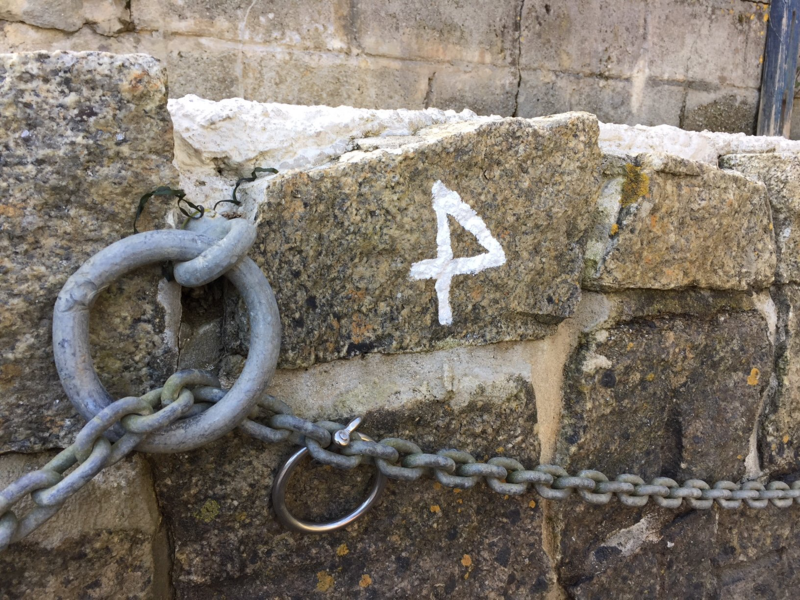 It was only then that I discovered that in straightening the chain, some of the running lines were short of the beach wall. So that was a lot of re-knotting, especially those lines that didn’t have enough slack in them to allow me to fix them. Apologies to all those whose lines have been retied or extended ! I have repainted the numbering on the beach and laid out the moorings with orange builders line. Bearing this in mind, I have kept last year’s backward-painted 4’s as a reminder of my own human failings as a yacht club manager. Apologies to Kurt Jewson and Shane Flutter who have to endure another year of backward 4’s.